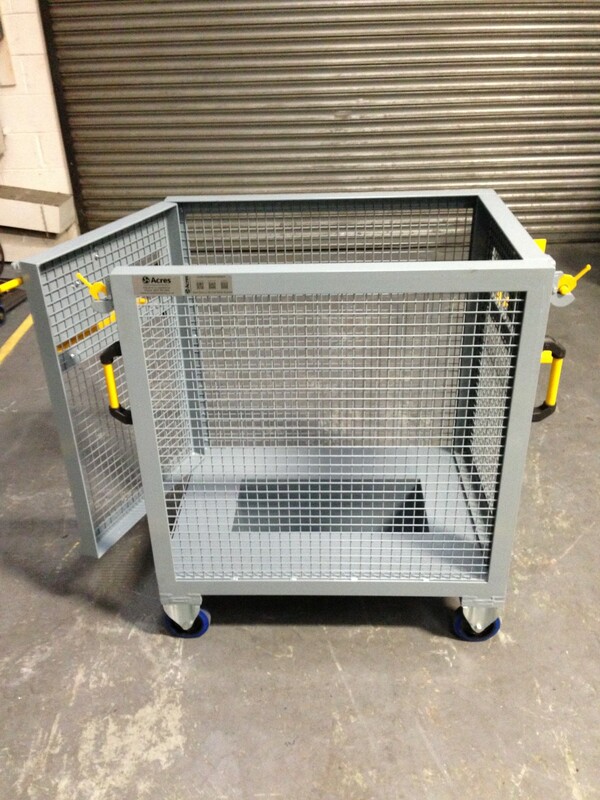 The trolley has been fabricated from 50mm x 50mm x 5mm RSA for the main frame and 1″ x 1″ x 10swg weld-mesh for the infill panels. The base is made from 2mm thick mild steel sheet and features a lowered centre section so taller items can be transported. On each end there’s a door fitted with bullet hinges and a spring loaded catch. Also both ends feature 2 off bridge handles to push and pull the trolley. 4 off 160mm diameter fixed castors have been bolted to a 10mm thick plate running along the length of each side on the base. The base section features a guide to activate a switch in the lift and the side of the trolley has a latch system to lock it in place when in the lift. Have a design and development project you want the Acres team to look at? Can’t see what you want? Need something different? Acres Engineering is established as a leader in delivering bespoke creative engineered solutions. Many OEM’s and tier one/ two suppliers in aerospace, automotive, rail and power generation industries have chosen us as their solutions partner because of our innovative attitude towards individual challenges and commitment to continual improvement. © Copyright 2019 - Acres Engineering Limited.